This walks you through the process of creating an ISO image of patches for your version of Microsoft Windows. This is handy for systems without internet access, standalone systems or maybe as a archive of patches just before Microsoft pulls the plug on support. A good example is Windows 2003. Its slated for EOL/EOS next year. Other scenarios include disaster recovery or forensic reconstitution. 1) Download http://download.wsusoffline.net/wsusoffline931.zip and extract it to a location of your choice. Make sure you have enough space for your patch set. To be safe, make sure you have at least 4 gigs of space for the ISO file that gets created. a. Select English under Windows 2003 (for x32). b. Select Clean up download directories. e. Include C++ Runtime Libraries and .NET Frameworks. f. Create ISO images(s) per selected product and language. g. Click Start to begin the download of patches. If asked to update your Root certificates, click Yes. 3) A command prompt will open and start the download process. a. When the download is finished a popup appears. Click Yes to view the log. Scroll through the log and verify no errors. 4) When the download completes you now have a patch repository. 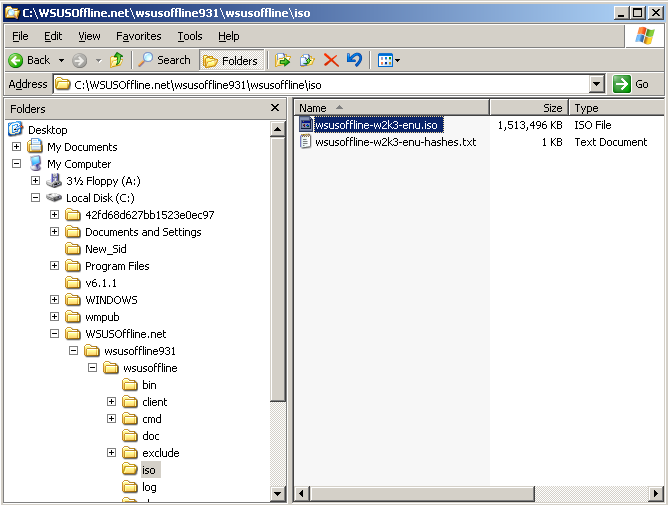 Browse to the ISO folder where you extracted the files (….\wsusoffline\iso). You should see an .iso file in the folder. Burn that file to DVD. a. Note: if a you are patching a VM, copy the iso file to a datastore and mount through Edit Settings CD/DVD on the VM. b. If a phaysical server, burn to a DVD or use Daemontools, MagicISO or similar ISO mounting utility to mount the iso. b. Install .NET Framework 3.5 SP1. 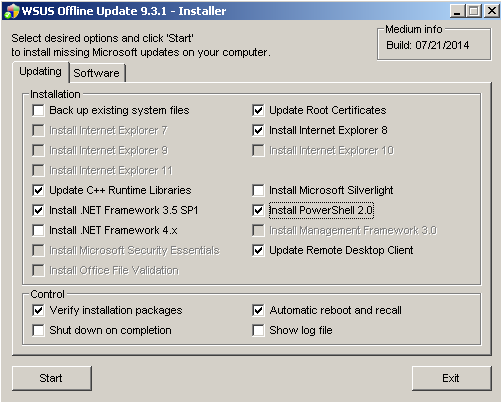 d. Install Internet Explorer 8.
f. Update Remote Desktop Client. h. Automatic reboot and recall. i. Click Start to begin. Offline Update scans the systems to see what updates are required. j. Note: If your system is quite old or a GA release, you will be prompted to manually reboot. Watch the cmd prompt that launches and check to see if it asks you to manually reboot and restart the update process. If so, simply reboot the server, login and run <cd cdrive>:\UpdateInstaller.exe again. You may be asked to do this a few times. Also, don’t forget to select “Automatic Reboot and Recall” if you are asked to launch UpdateInstaller.exe. k. Keep running this process until there are no more updates to apply.